Krishna is usually regarded as the eight incarnation of lord Vishnu and was born in the Dvarpara Yuga as the “dark one”. Lord Krishna is the embodiment of love and divine joy, that destroys all pain and sin. He is the protector of sacred utterances and cows. Krishna is an instigator of all forms of knowledge and born to establish the religion of love. Krishna was born as the 8th child of Devaki, sister of the cruel demon king Kamsa. The sage Narada had predicted that Kamsa would be killed by his nephew, so the king killed Devaki´s first six children. The 7th, Balarama escaped and the 8th, Krishna, was secretly exchanged for a cowherds daughter. The demon king Kansa send many demons to kill Krishna, but all were defeated. Among them were the whrilwind demon Trinavata, Vatasura disguised as a calf, the enormous crane Bakasura, Aghasura the demon snake and the monstrous horse Keshisura. Lord Krishna also mastered the five-headed demon snake Kaliya, to stop it from poisoning the holy river Yamuna and send it back to the ocean. He jumped on the snake from a big Kadamba tree and then defeated him by dancing on his heads. 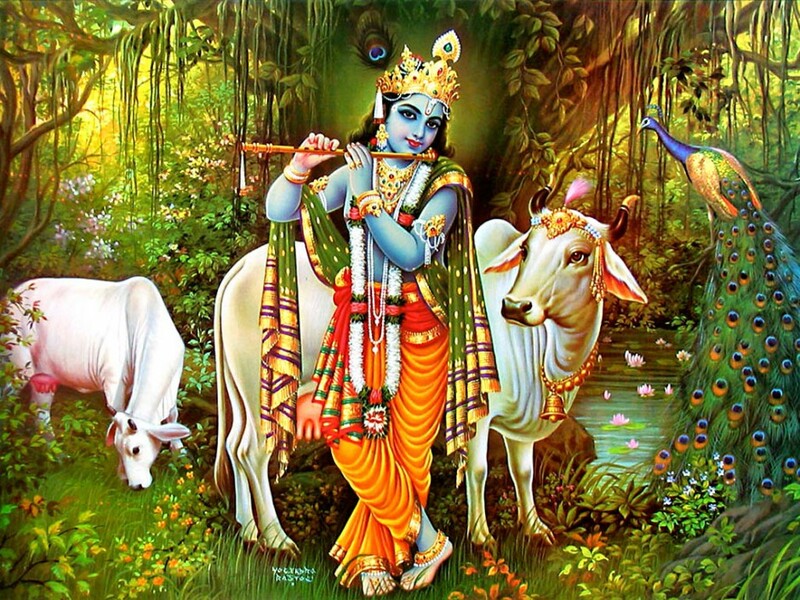 Krishna was brought up in a cowherds family and loved to play the flute to entertain the other cowherds, the milkmaids, and the cows. As a child, Krishna had great love for his foster-mother Yashoda and their relationship stands as a great exemple for the love between a mother and her child. Krishna also became very famous for teasing the milkmaids of Vrindavan as well as Yashoda. He and his friends would steal milk and butter, let the cows go free at milking time, hide the clothes of bathing girls or even break the water pots the milkmaids were carrying on their heads. Little Krishna was not just teasing purely for the fun of it. He wanted to destroy the ignorance of his devotees, teaching them not to be attached to matter and forms and only focus on him. As such, Lord Krishna is the deity of Hasya or Humour and a messenger of peace. Radha and Krishna are the divine couple that rules love, romance and the aesthetic sense. Radha was foremost among the milkmaids of Vrindavan, as the incarnation of Lakshmi, Vishnu’s spouse and Krishna’s obvious favorite. Love and devotion may also find beautiful expression in the relationship between lovers. In India, women often see their husbands as Krishna, while men see their wives as Radha, the beloved. When men become gods and women goddesses, then we do not see the imperfections, and see only perfection, divinity. Surrender and serving each other are the keys to any good relationship, which becomes a rehearsal of surrender to the universe and the divine. While Krishna’s love was truly universal, Radha sometimes expressed feelings of jealousy. Like it is shown in the painting here, one day Radha became jealous of Lord Krishna’ flute, because it was allowed to touch his lips and because he would breath his prana into it. Thus she took it from Krishna and then did not want to return it. Some thus see the relationship between Krishna and Radha as the love between god and man, between self and ego. One moonlit night, Krishna multiplied his body into many to dance with all the milkmaids and fulfill their desire for union with him. The love between Krishna and the milkmaids represents the divine play (Leela) between reality (consciousness) and illusion (form), purusha (soul) and prakriti (primordial nature), divinity and humanity. The maidens dance around Krishna as electrons dance around the nucleus of every atom, and as body molecules and energies dance around the soul of every being.